I don’t care that there are a handful of running backs with commensurate or superior numbers or that Barry lost five spectacularly on occasion when the team needed one. He often made the line of scrimmage obsolete (which may be why he frequently ended up on the wrong side of it) and turned the game into the kind of free-flowing, tentacled procession that you see when kids play “kill the carrier” at the playground. At something everyone has tried — running away from people — he did it in a way that was qualitatively different. — David Epstein is a Senior Writer at Sports Illustrated and an all-around great guy. His book The Sports Gene on the science of athletic performance comes out this week. “Kill the carrier” just doesnt has the same ring to it as the un PC term most of us played as kids in the old days. A wonderful piece, and I couldn’t agree more. As a kid, he made love watching football. I still, however, blame him for turning me into a Lions fan. 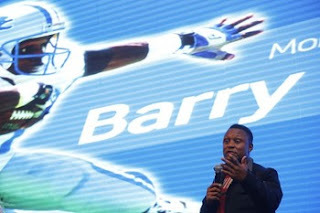 Barry Sanders would be about the last “Great” player I would draft if I were starting a franchise. But he’s among the first I would want to see play.